The life of a gingerbread girl..: Rice pudding like you had in school? I think not!!!! Rice pudding like you had in school? I think not!!!! I had a request for rice pudding this weekend...I'm a bit of a dessert snob, so looked at him in disgust.... '"You want rice pudding???? "...It's baby food, lumpy school dessert food or even worse... dessert from a can food!! Could I be any more pretentious if I tried?... Well, I could have served it in a cocktail glass!! Thankfully this is a pretty simple dessert to make... I'm not sure I'd have enjoyed going to great lengths for rice pudding! Start by bringing the milk, cream, caster sugar and sliced vanilla pods to a gentle simmer in a heavy based saucepan. Add in pudding rice and leave to simmer over a low heat for 15 minutes, (you can make a start on the compote and nut garnish while you wait) or until the rice is tender and you have a creamy pudding. At this stage, if you prefer a thinner consistency, add in a little more milk if you find the pudding too thick for your taste. *The health nut in me just had to adapt this recipe. The original recipe called for 600ml whole milk, and 200ml of double cream. No doubt this makes a rich, creamier pudding, but a little excessive for a casual Saturday dessert I think! The low fat milk created a creamy pudding with far less calories, and I honestly don't think the double cream is a necessity. Place ingredients in a saucepan. Bring to the boil, and leave to simmer until you have a thick syrup coating the cherries. I can't stand food that lacks texture... for me, I always need something crunchy to kill the feeling that I'm eating baby food! I adore pistachios, and there's not much that can't be improved by adding a little crunchy garnish. Take the shelled nuts, place in a dry frying pan/or baking tray in the oven, and allow to toast gently using a low heat for 4/5 minutes. Don't allow the nuts to brown, or you will end up with a burnt aftertaste in your mouth! Toasting the nuts allows the natural oils to be released, giving a better flavour, and a fantastic fresh aroma. 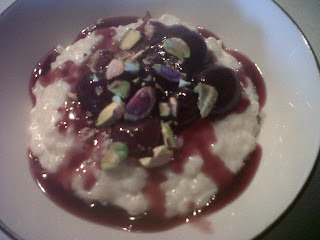 Even though I couldn't resist glamming rice pudding up, there's no need to go crazy on the presentation of the dessert. Sometimes, less is more, and the taste of this dessert speaks for itself. Spoon generous helpings of the rice into bowls. Pour some compote over the rice, and finally top with toasted pistachio nuts. I have to admit, rice pudding was never really my thing, but I really liked this dessert. It was warming, flavourful, simple to make and most importantly got several nods of approval..